Harare – The year 2018 will soon come to a pause. Year 2019 will soon take over. And it has been twelve months of pouring jecha (sand). Literally, sand exemplify plenty – and much more. And indeed the year has presented a mixture of all. With memories of the November 2017 coup that demoted Robert Mugabe to an ordinary citizen still fresh, 2018 commenced with defeating news. Morgan Tsvangirai – the idol of Zimbabwean democracy departed. A date designated for love became an hour of mourning. His prolonged battle with colony cancer ended on the 14th of February. Grievers gathered as sand on a beach to convey their condolences to a man esteemed for reigniting the constricted democratic space in the country. Even his tormentors during his existence became admirers, saluting a doyen of democracy. This writer could not skip this momentous, yet solemn occasion, so he was present. In short, the emotions exhibited were genuine, until his final rest in Humanikwa village, where he had showcased leadership traits as a herd boy. Tsvangirai’s death ignited a leadership takeover frenzy. With impeding elections on July 30, there was a yawning guidance vacuum. Nelson Chamisa stepped into the big shoes. His rallies were occasioned by mammoth crowds. Chamisa’s war cry ‘tozvidira jecha’ soon became a chorus. As a metaphor, sand is a symbol of weight. The resultant elections witnessed a high turnaround, with a record twenty three presidential candidates. Harare’s polls possessed weight to resuscitate the nation from prolonged dearth. As such, world powers arrived to observe the first ever elections minus Mugabe. Sand can also pronounce instability – something that exits briefly, such as sandcastles. This can be alluded to the popularity accorded to the opposition. For soon after the election, their popularity seemed to be dwindling into the far off horizon. The ruling party also faded into the night, with their promises of resuscitating the economy facing a daunting task. The resultant friction watched both in parliament and courts represented a lot of friction that results when sand is involved. 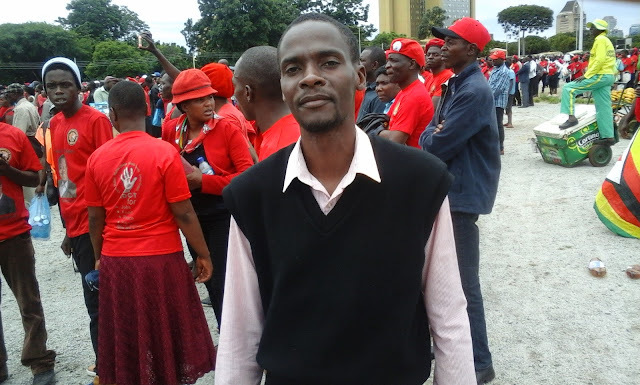 Abrasiveness, such as the one witnessed on August 1 2018 in Harare is also another meaning of sand. On the day, six innocent lives were lost, after soldiers shot arbitrarily at crowds in the CBD. The ensuring inquiry report has encouraged debate between warring parties to bring sanity to the painful nation. Naturally, creative minds sprang into action utilising the trending symbolism. The gaffer of Zimbabwe dancehall music Winky D penned a song inspired by the jecha allegory. Though the intention was concluded as political, his intentions are not wayward compared to other imaginative people using Donald Trump or Jacob Zuma to propagate their commercial cause. And in everything you do, know you are part of the sand because you were once dust – and you will eventually become dust.